Recently, I’ve been working in Cobb County and commuting from my own (barely) suburban area across town to another suburban area. I actually used to have my office in Cobb County, so I am pretty familiar the area. Unfortunately, it also has a lot of negative connotations in my mind due to my only experience with the area being work related and my work having a lot to do with criminal activity. Over the past several weeks, I’ve driven past a place called Heritage Park and I never really gave it much of a glance. I just took it for granted, sitting there on the corner of Fontaine and Nickajack Roads. But day after day of driving through this intersection made me curious. 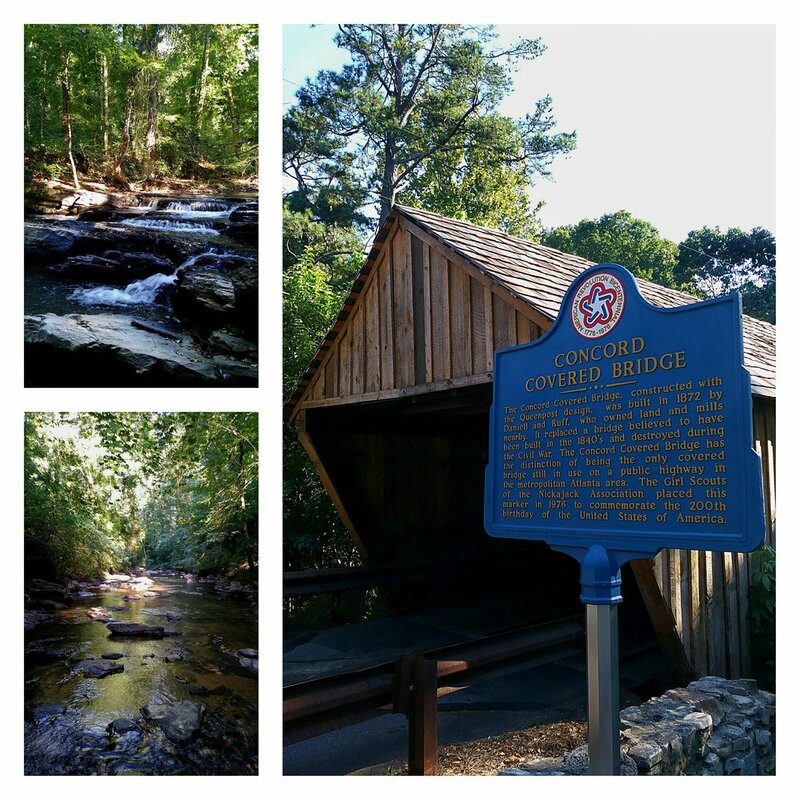 It’s near the Silver Comet trail and the historic Concord Bridge area. Again, unfortunately, I only had negative associations with this area (Google “silver comet trail assaults” if you’d like). But one day, I just couldn’t stand the thought of sitting in traffic any longer so I stopped off at Heritage Park to explore. Of course, I did my little excursion after work since that’s the time of day I had available. This is my personal opinion, but I would not recommend being here at dusk or beyond. That disclaimer aside, I really did enjoy the park and it gave me a new, positive view of the area. There are bathrooms and a nice picnic pavilion near the parking area. On the Nickajack Road side of the parking lot, you’ll find the beginning of the trail, which is nicely planted with flowers. The trail reaches a boardwalk after a short distance, crossing a marshy area filled with wildflowers and butterflies. The boardwalk then turns into a bridge crossing Nickajack Creek. I always thought Nickajack was just a funny name, but the creek itself is really pretty. The trail follows the creek along a pretty much entirely flat trajectory, with little side trails going down to the water along the way. There are also benches and little covered rest areas throughout the trail. I am not entirely sure of the water quality of Nickajack Creek, but it was clear and I did see some people letting their dogs swim in it. That being said, of course, it’s important to clean up and leave no trace! Now, the downside to this part of the trail is that it’s right next to the East-West Connector, so I did hear traffic the whole time, but at least I was not sitting in traffic!. Eventually the trail reaches the ruins of an old mill and a side trail to the right leads to the Silver Comet trail. I am not entirely sure of the history of the ruins and have not had time to research it, but I’m guessing it was probably a cotton mill. Now, here is where I got a little confused. At the mill ruins, the trail also continues straight ahead. Since this trail is so flat and easy, I wanted to continue walking so I did. The trail continues to follow along Nickajack Creek but rises slightly in elevation above the creek. Then suddenly it pops you out onto Concord Road right at the revered covered bridge. At first I was pretty happy because I wasn’t sure the trail actually led to the Concord Bridge, but I planned to drive down there after my hike. So I crossed the road and took a few pictures of the bridge and then returned to the trail. Coming from the opposite direction, though, I saw signs near the trail indicating private property. Hmmm. I saw no such signs on the trail leading away from the ruins so if I made an error and trespassed, it was not intentional. So I quickly hiked back down the trail returning to Heritage Park. Please be advised, I am not entirely clear on property lines in this area so should you follow this route, do so with caution. 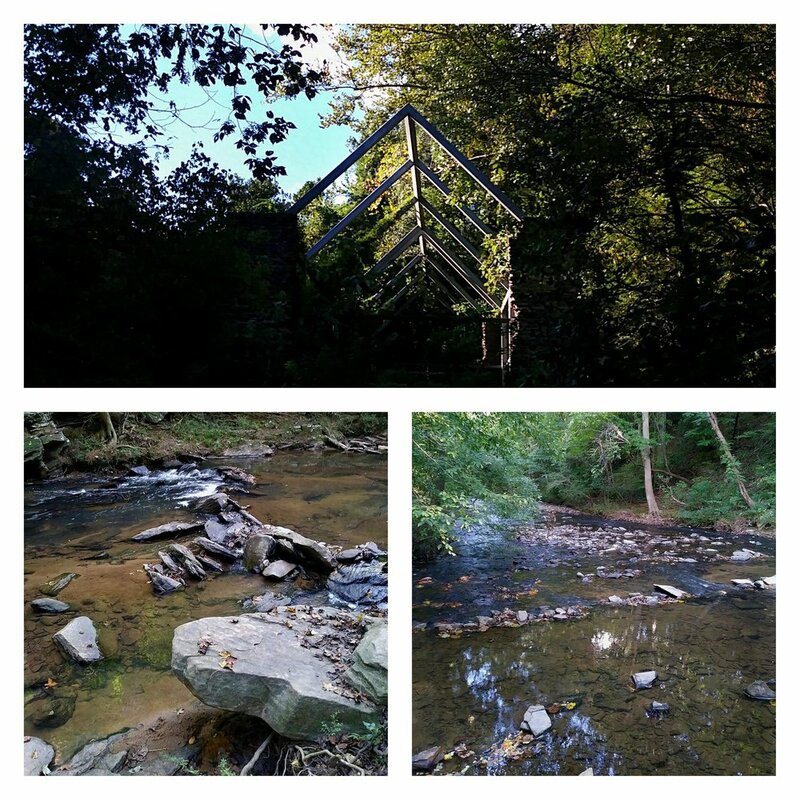 All in all, Heritage Park is definitely a great neighborhood hike for those in the Smyrna/Mableton area. It’s dog friendly, well maintained, and has a lot of interesting features. 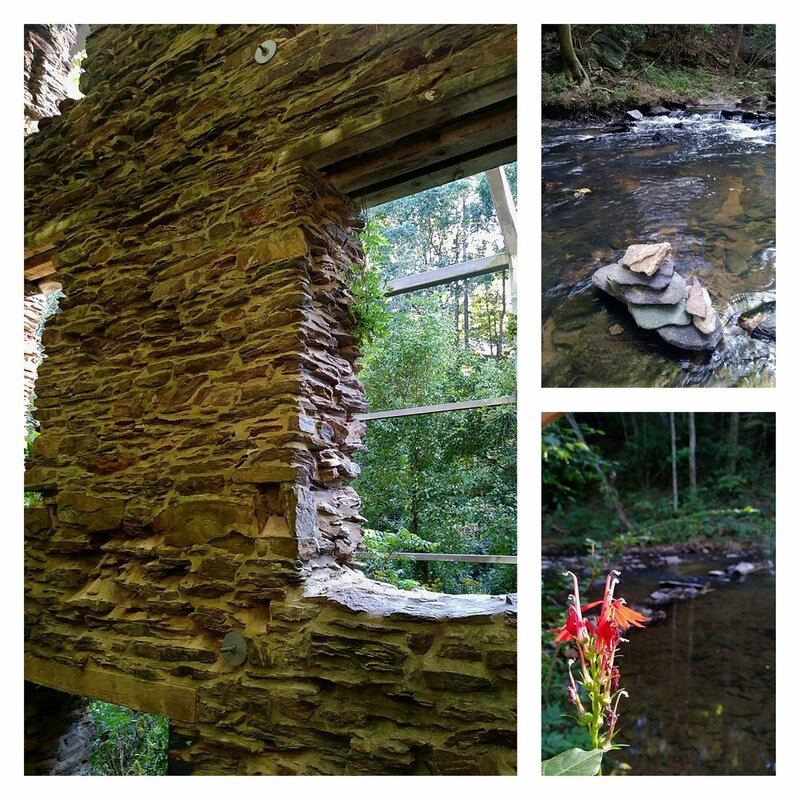 I always enjoy places with a historic aspect, so the mill ruins were a real bonus. If you’re like me and hesitant to get outside whatever notion you have about a place, just do it. Stop and explore. Don’t let neat places pass you by!